Proposed three-mile fence would run through center of the former camp. 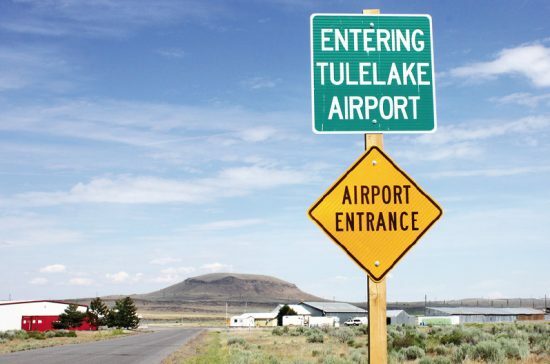 Currently, the Tule Lake Committee (TLC) and various stakeholders are in discussions as to how to resolve the issue of the local municipal airport proposing an expansion in the middle of the former Tule Lake Segregation Center. The various stakeholders include, among others, the TLC, the Federal Aviation Administration, Modoc County, the owners of the airport, and the various businesses that rely upon the airport, such as the farmers, fertilizer companies and manufacturers of chemicals used in crop dusting. 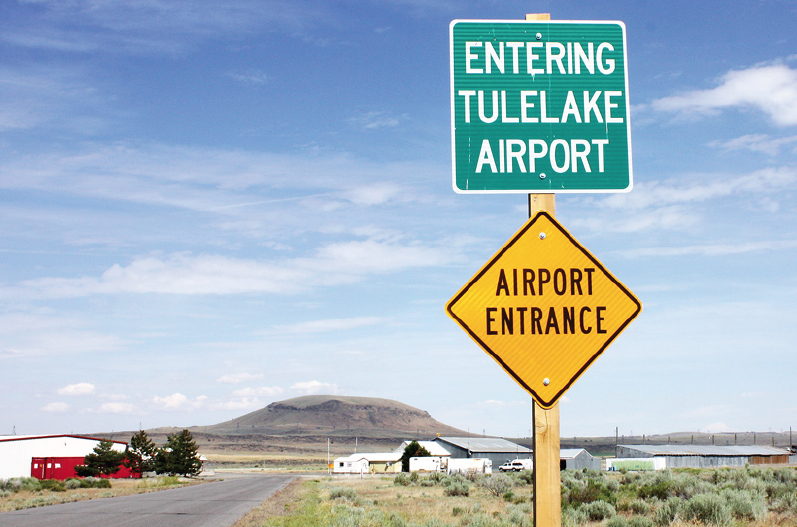 The airport, used mainly by crop dusting airplanes for local farmers, sits on about two-thirds of the former Tule Lake camp. A past camp firebreak that ran through the middle of Tule Lake has been converted into the airport runway. 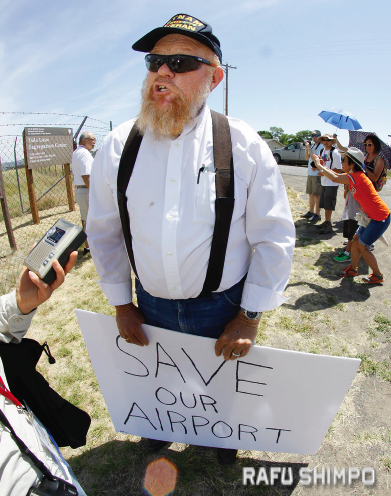 Three years ago, the TLC gathered hundreds of signatures and letters to temporarily halt construction of a proposed three-mile-long airport fence that would have run through the center of the former camp site. Barbara Takei, TLC chief financial officer, noted that the involvement of Janet Eidsness was also instrumental in temporarily halting the fence construction. According to Eidsness, she received a phone call from Takei, seeking her help. Eidsness was well-known for her work with various California tribes over preservation issues. 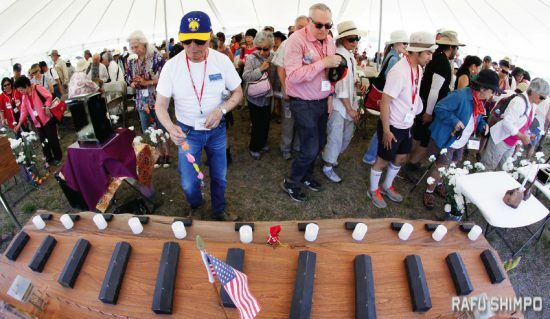 Eidsness was also familiar with the Tule Lake camp site since she had worked as an archeologist for the National Park Service at the Lava Beds National Monument during the late 1980s into the early 1990s. When Takei explained to Eidsness about the TLC’s effort to stop the proposed airport fence, she asked to read the various reports done by the local government. Eidsness then discussed with the TLC about Section 106 of the National Historic Preservation Act and the importance of a Traditional Cultural Property. “Section 106 is one of the real important, key federal laws that says if you have an important historical site, that you have to fairly consider the impact of your project,” said Eidsness. Since then, Dr. Thomas King, who, along with Patricia Parker, wrote the “Guidelines for Evaluating and Documenting Traditional Cultural Properties” for the U.S. Department of the Interior, National Park Service, has also taken an interest in the Tule Lake issue. King and Eidsness spoke at a workshop at the pilgrimage, updating the attendees as to the status of the Tule Lake site and efforts to preserve the area. Unlike the Manzanar site, which was mostly owned by the Los Angeles Department of Power and Water after the war, the Tule Lake site has numerous property owners. Whalen said the NPS has been closely involved in the various meetings among stakeholders. The issue, however, has created divisions among the stakeholders. One of the more visible consequences of this rift was the absence during the pilgrimage of the traditional barbecue lunch hosted by the local volunteer fire department. Additionally, David Misso, a lone protester, stood silently with a placard during the inter-faith ceremony by the jail. While Misso has attended mediation meetings, he felt those who oppose the airport expansion do not understand the issue since they are outsiders. “The stakeholders should be better represented by the people who live where the event is, rather than from other areas,” said Misso. “Has rural America ever gone to you and told you to close LAX because it’s a cesspool of dirtiness and of pollution? Has any rural American ever tried to shut down an urban area? You can get petitions signed by millions of people…They’re from Germany, France — they don’t know this area. During a panel discussion that was open to the local community, actor/activist George Takei referred to the tension caused by the airport expansion issue. “I understand there’s some division here between the local people and the Japanese Americans because of the internment camp story,” said Takei. “I want you all to understand that what happened to us was an American story. We are American citizens, who happen to look like the people who bombed Pearl Harbor. 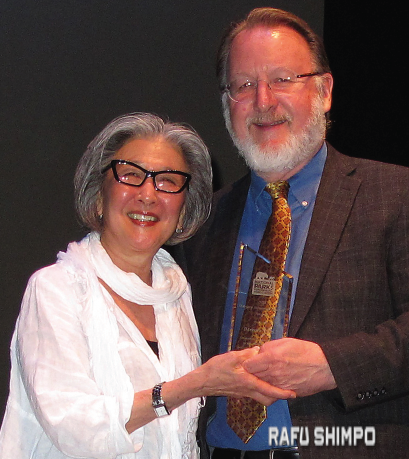 Amidst the controversy, Barbara Takei was awarded the prestigious National Park Conservation Association’s Marjory Stoneman Douglas Award during the pilgrimage. Ron Sundergill, senior director of the NPCA’s Pacific Region Office, presented the award, which is given to those who go to great lengths to advocate for and to fight for the protection of the national parks. Sundergill congratulated Takei and the TLC for organizing a campaign to have Tule Lake designated as a national monument and then ensuring that the site had funds and resources. He noted that Takei and the TLC raised more than $800,000 in both actual dollars and in in-kind donations that were matched by grants from the federal government. Takei also received commendations from Reps. Mike Honda (D-San Jose) and Doris Matsui (D-Sacramento). The TLC is starting the next phase of the jail restoration fundraising campaign. To donate, write checks to the Tule Lake Committee, Inc., and mail to PO Box 170141, San Francisco, CA 94117 or donate via Paypal at www.tulelake.org. The TLC tax ID# is 94-2699521. Martha, Excellent article covering all phases of the Tule Lake Segregation situation. And Mario, thanks for a great photo of Mr. Misso. It speaks loudly.